Dear Mark Zuckerberg & the Facebook team. The United Nations projects that a billion people will die from smoking this century. That is nearly everyone in the United States & Europe. There is rampant corruption taking place that is helping make this happen. They are motivated by cigarette taxes, pharmaceutical sales, grant money, & power. Now it appears that you are standing with these corrupt forces. Would you like to see a billion people die? We are making a film to help people discover what’s going on in the world. We’re trying to use Facebook to make the world more open, to stay connected, and to give people the power to share what matters most to them…a way to save the lives of their families, friends, and themselves. Your platform already discriminates against pages that don’t pay to boost Facebook posts. Consequently, our posts are seen by very few people when we don’t pay, despite having thousands of supporters looking for our updates. Now you are removing our ability to promote posts too. You call our film a tobacco product, yet we are trying to help people quit. You promise to make the world more open, but you are closing it off. 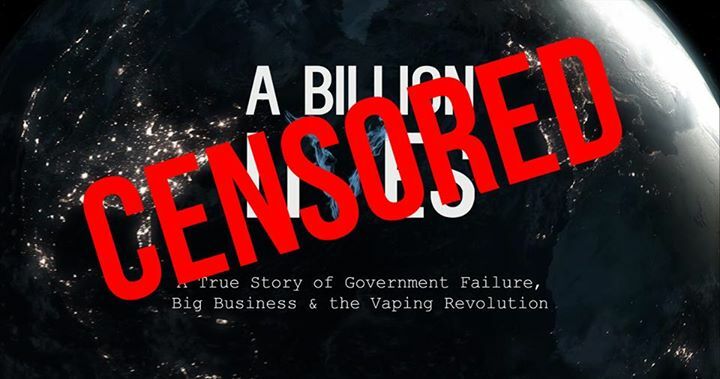 We call on you to end your ongoing censorship of our film, and to allow advocates for a smoke free world to share information and connect with each other. Every post with the word vaper, vape, or vaping should not be automatically censored. Your reviewers should pay attention to those of us that ask for clarification, not tell us “The decision is final.” Every time you censor us or others with a similar message, you are protecting the status quo: a billion people dying from smoking. A war has started. It’s time to choose a side. Reproduced with the kind permission of A Billion Lives, for the benefit of people who treat Facebook with the contempt it deserves! I’m proud to announce that Facebook has reversed their position. Our ads are no longer censored. That’s not all we’re going to do. This is just the beginning. It was inspiring to see all the support we’ve received, but now it’s time for me to get back into the editing room and finish the film. It’s getting close. Then, we’re going to drop this bomb, end this war, and save hundreds of million of lives. Together. Thanks for sharing our letter. It’ll be hard for them to ignore all the noise the vaping community is causing.